What do you do when you're the former king of sports sedans but suddenly find yourself playing second fiddle to the upstart 2010 Audi S4? You tweak the boost a little and call it the 2011 BMW 335is. Taking a temporary break from building the ultimate SUV, BMW's found the time to refresh the entire 2011 BMW 3-series range. All models will get a series of newer bumpers, LED Lights and other visual tweaks. Significantly, the new automatic transmissions are getting the "pull/pull" paddles instead of the current push/pull variety. 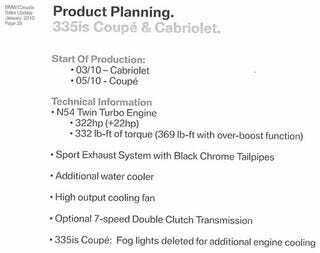 As you can see in this leaked document from BMW Canuckistan, the 335is is adding to all the above with an extra 22 HP, 32 Lb-Ft of torque and an overboost function capable of delivering up to 369 Lb-Ft on demand. More intriguing, since the aftermarket already manages much higher numbers, is the addition of an additional water cooler - potentially increasing tuneability - and the optional 7-speed dual-clutch gearbox. We also like the sound of the deleted fog lights, gone to increase air flow. It's a little disappointing that the 335is can't match the BMW Z4 35is and its 355 HP output, but we're hoping the weight saved by the lack of huge "SDrive" badges will make up for that lost performance. More details over at E90Post.